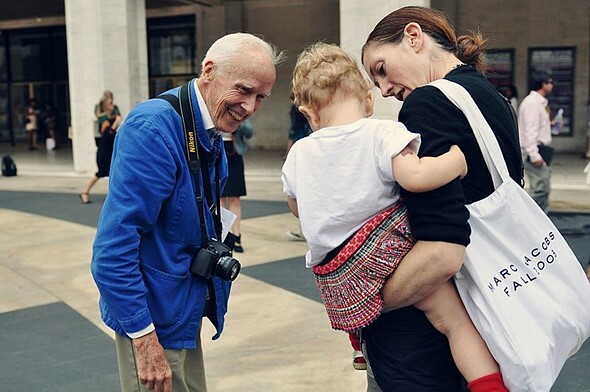 Bill Cunningham at Fashion Week photographed by Jiyang Chen. May 2012. Over the weekend, the photography and fashion communities lost a living legend when Bill Cunningham passed away at age 87. He chronicled New York City street fashion trends – from fanny packs to designer bags – for almost 40 years for the New York Times. ‘I never bothered with celebrities unless they were wearing something interesting.’ Cunningham’s 2002 article on his own body of work for the Times explains his approach. He took as much interest in what people were wearing in Harlem and downtown as he took when photographing New York’s elite at countless galas and runway shows. Cunningham was known by his signature plain blue jacket and bicycle, and was named a ‘living landmark’ by the New York Landmarks Conservancy. Cunningham was hospitalized recently after a stroke, and the news of his passing came not long after this Saturday.